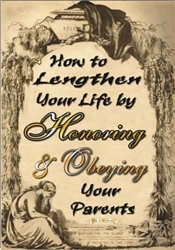 The only commandment of the 10 Commandments that came with a promise was the 5th one: “Honour thy father and thy mother: that thy days may be long upon the land.” God gives you and me the power to shorten or lengthen our physical lives. Life is not all static, set, and predetermined. Though man alone cannot change the date of his death, there are things man can do that will cause God to change it. How amazed we may all be when we get to heaven to find that someone lived far longer than he would have lived because he honored his parents. This message not only defines and illustrates honor and obedience, but it also graphically demonstrates how a person can use them to shorten or lengthen his life. Your children will never forget the changing dates on the tombstones on this dramatic video!